COLERAINE ended their Solitude jinx on Easter Monday with a merited victory in atrocious conditions. Derek Cook’s 16th goal of the season and Paul Carlyle’s 11th enabled the Bannsiders to take the points in a game which burst into life in the second half. 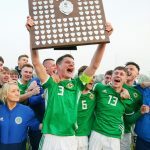 It was Coleraine’s first league success against the Reds in Belfast for almost SIX years! Their last triumph was a 2-0 win on April 2, 1988. 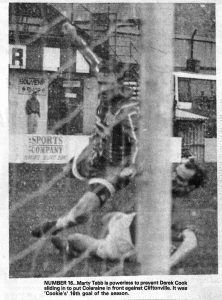 But the joy was marred somewhat with the dismissal of Billy McCurdy who was sent for an early bath along with ex-Glentoran striker Ron Manley. Trevor McMullan returned from his one match suspension and had one of his best games for the club while Willie Greer did well at left-back after replacing the injured Anthony Gilmore after just 14 minutes. The visitors did most of the pressing in the opening stages and McCurdy twice went close with shots from the edge of the box, but the pressure paid off when they edged ahead after 22 minutes following a slip by former player Marty Tabb. He lost his footing allowing Carlyle to run free and his pass was turned home by the unmarked Cook. 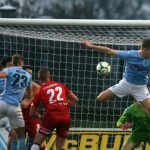 Cliftonville thought they were back on level terms after 29 minutes when McCann let fly with a shot which flashed past Davy Platt but the effort was ruled out for an offside which only the linesman seemed to see-Stuart McLean went close two minutes later with a powerful header from Carlyle’s free-kick but American ‘keeper Nicky Brujos made a super save. McMullan fired agonisingly wide either side of the break after surging runs which he made all afternoon. Coleraine appeared to be in the driving seat when they stretched their lead after 52 minutes. Alan Ewing, who worked hard in midfield, powered his way past three defenders and when his shot was blocked on the line, the impressive Carlyle managed to regain his footing to drive the ball home. But any hopes of a smooth passage through to the final whistle were dented within five minutes as the Reds reduced the arrears. McMullan and Paul Gaston before drilling his shot past Davy Platt. Chris McCreadie was presented with a chance after 66 minutes when Platt twice dropped a cross but he shot into the side-netting. Then, with a quarter of an hour remaining, McCurdy and Manley became involved in little more than a bit of pushing. But it was to prove costly as both men were sent packing. Ewing went close to restoring the two goal ad-vantage but he blasted over from a good Johnny Mclvor pass. 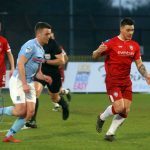 It was Cliftonville though who went close to snatching a draw in the dying stages but Platt produced two fine saves to keep out long range efforts from Gary Sliney and Kieran Loughran. CLIFTONVILLE: Brujos, Loughran, McCreadie, Tabb, Murray, Strang, McCann, Manley, Flynn (Smyth ‘ 53 mins), Sliney, Shearer (O’Kane ’60 mins). COLERAINE: Platt, McMullan, Gilmore (Greer ’14 mins_, Gaston, McLean, Carlyle, Mclvor, Ewing, Cook, Patton, McCurdy.